Randac is an ancient King of the Inhumans who ruled over them 25,000 years ago. He is revered for inventing Terregenesis. King Randac is an ancient leader of the Inhuman's. He is revered by the Inhuman's because he created the process of Terrigenesis. Terrigenesis is the process by which Inhumans are exposed Terrigen and evolve. Sometimes they gain powers, sometimes they devolve into beasts. Randac is king of the humans and a brilliant geneticist he creates a method utilizing Terrigen Mist to greatly speed up evolution. He tests this process on himself and it is a great success. 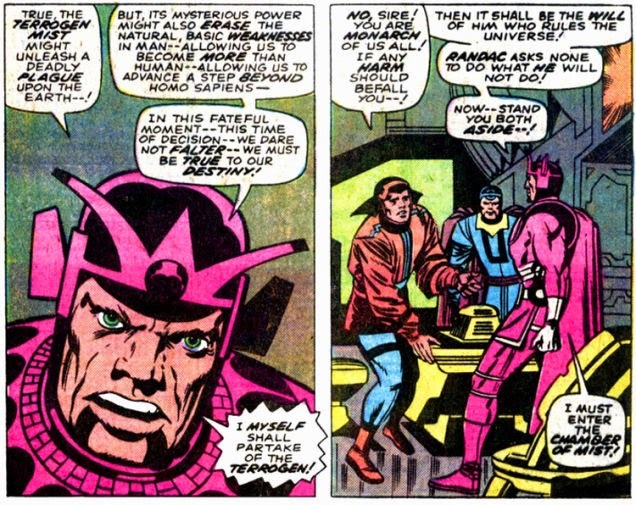 He gains vast mental powers making him the equivalent of the highly advanced Eternals. The Inhumans up until this point are roughly the equivalent of humans. They are physically stronger but do not have super powers. He then wants his people to share in his success and releases the Terrigen gas through out the population. This is a a major disaster. A bulk of the population is turned into monsters, later called Alpha primitives. The Alpha Primitives become something of a subcaste of Inhuman society doing manual labor and sometimes rebeling. The Inhumans go years and years of genetic tweaking the elements within their genes that lead to devolution. The genetic tweaking of Inhumans by both the Kree and themselves lead them to be genetically dissimilar to other humans. Attilan was not created until 7000 years ago. Meaning the facilities he used preceded the creation of Attilan by thousands of years. However, the Temple/Tomb of Randac on Attilan may be wear the remains of this facility are stored.